13.1.1906: Launched by Cook, Welton & Gemmell Ltd, Beverley (Yd.No.101) for William Grant (32/64) & Dawson Robinson (32/64), Cleethorpes as AUCUBA. 3.1906: Completed trials and accepted. 9.3.1906: Registered at Grimsby as (GY117). 9.3.1906: William Grant designated managing owner. 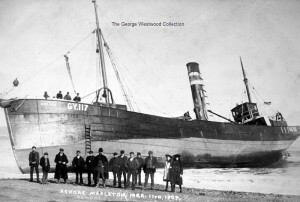 11.3.1907: Stranded at Mappleton. Refloated and returned to service. 9.5.1907: Tonnages altered to 84.43 net following survey at Grimsby dated 10.4.1907. 26.4.1913: In North Sea responded to distress from German steamer KATE (448grt/1899) bound Bosum, near Hamburg, which had sprung a leak and filling. Connected and commenced tow but vessel started to settle as pumps could not cope. Crew abandoned in boat and picked up. Vessel foundered shortly afterwards. 27.4.1913: Arrived Grimsby and landed survivors. 12.1914: Requisitioned for war service as a boom defence trawler (1-3pdr). Based Lerwick. 10.9.1923: Probate granted to sole executor, Harry Robinson. 15.2.1924: Harry Robinson (32/64), Grimsby registered as part owner. 13.4.1927: Probate granted to the Executors, Arthur Grant & John Wilfred Grant, Grimsby. William Grant ‘the younger’, Navenby and Hugh Bourne Grant, Humberstone (64/64 joint owners). 28.5.1927: Joint owners (32/64) shares sold to Arthur Grant (11/64); John Wilfred Grant (11/64), Grimsby and Hugh Bourne Grant (10/64), Humberstone. 1.6.1927: Hugh Bourne Grant designated manager. 7.3.1929: Harry Robinson (16/64) shares sold to Fred Dawson Robinson (16/64), Grimsby. 3.6.1929: Hugh Bourne Grant designated manager. 28.2.1930: John Wilfred Grant (11/64) & Hugh Bourne Grant (10/64) shares sold to The Rugby Steam Fishing Co Ltd (21/64), Grimsby. 7.3.1930: Arthur Grant (11/64) shares sold to The Rugby Steam Fishing Co Ltd (32/64), Grimsby. 13.3.1930: Hugh Bourne Grant designated manager. 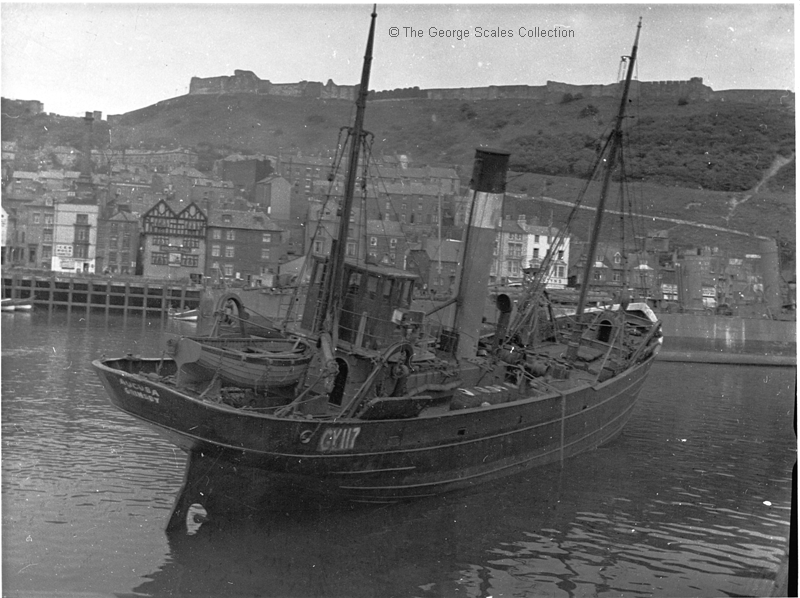 26.4.1933: The Rugby Steam Fishing Co Ltd (32/64), Harry Robinson (16/64) and Fred Dawson Robinson (16/64) shares sold to The Filey United Steam Trawling Co Ltd (64/64), Scarborough. 2.5.1933: Richard Ferguson Cammish designated manager. 26.6.1933: Vessel mortgaged (64/64) to J. W., H. B. & C. A. Grant Ltd, Grimsby for the sum of £900 with interest at 5% (A). 17.7.1934: Vessel mortgaged (64/64) to National Provincial Bank Ltd, London (B). 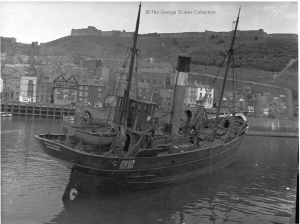 14.8.1939: Vessel mortgaged (64/64) to The Scarborough Pure Ice & Cold Storage Co Ltd, Scarborough for the sum of £600 with interest at 41/2% (C). 1940: Fitted with defensive armament. 22.2.1940: Fishing in North Sea (Sk. A. Normandale) in company with trawlers CARDEW (H157), CRYSTAL (SH58) and EMULATOR (SH83) attacked by German aircraft. Returned fire and aircraft withdrew; no casualties. Later in company with PERSIAN EMPIRE (FD83) and RIBY (GY594) attacked again by German aircraft with slight damage. Aircraft driven off by return fire. 30.1.1941: Robert Cammish Jnr designated manager. 7.10.1942: Sold to Parkholme Trawlers Ltd, Fleetwood. 13.10.1942: Basil A. Parkes, Cleveleys designated manager. 16.6.1944: Last landing at Fleetwood. 1.11.1944: Sold Rushcliffe Trawlers Ltd, Hull. 1.11.1944: Harvey Wilfred Wilson, Grimsby designated manager. 14.11.1944: Vessel mortgaged (64/64) to National Provincial Bank Ltd, London (D). 8.4.1948: Sold to Derwent Trawlers Ltd, Grimsby. 16.4.1948: Harvey Wilfred Wilson, Grimsby designated manager. 3.9.1951: Sailed Grimsby for North Sea grounds (Sk. Thomas Darwood); nine crew. 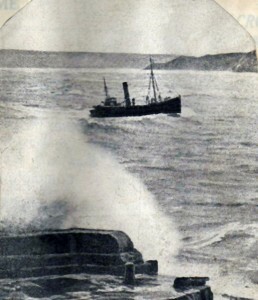 5.9.1951: Fishing in darkness 11 miles off Robin Hood’s Bay, run down by Italian steamer MARIA BIBOLINI (7167g/1943). Badly damaged and attempted to launch boat but tackle broke, six crew jumped in water and four remained onboard. Started to settle and all crew picked up by boat from steamer before vessel foundered. Survivors landed at Rotterdam. 6.9.1951: Survivors arrived in Hull in LNER steamer BURY (1686grt/1911). 07/12/2010: Page published. 5 updates since then. This entry was posted in Lost Vessels, Steam Trawlers, Steamers (Picture) and tagged Lost, Parkholme Trawlers on December 7, 2010 by Fred Smith.